Part of me wishes I had discovered this show sooner. The other part of me is glad I’m watching it now, after having seen and enjoyed more science fiction and after all the seasons are out on DVD. But regardless, my co-worker loaned me the first season, and after it sat around our house for a while, my husband and I finally started watching it. And we quickly became hooked. The first season has some flaws, which I will get to, but it was incredibly strong overall and I have thoroughly enjoyed the creative story and the characters. Fringe has a very fascinating story line, with most episodes based on a certain element of the “fringe” sciences, which include the likes of teleportation, pyrokinesis, hypnosis, etc. The show centers on FBI agent Olivia Dunham (played by Anna Torv), who is assigned to work with the fringe science division as more and more instances involving the fringe sciences occur in Boston, New York, and the surrounding areas. These events are a part of something referred to as “the pattern,” and the goal of the division to figure out what exactly the pattern is and who is behind it, that they might be stopped. To help her, Olivia recruits fringe scientist and genius Dr. Walter Bishop (played by John Noble), but before she can recruit him out of the mental institution where he has lived for the past 17 years, she has to first recruit his son Peter Bishop (played by Joshua Jackson). She finds Peter in Iraq, who reluctantly agrees to sign Walter out of the mental institution only after Olivia tells him she knows what the FBI has on him, and she will do something about it if he won’t help. Over time, the three truly become like a wacky, dysfunctional family that you can’t help but love. I really like Peter especially. It’s probably because of my love for The Mighty Duck movies, but he always has an intelligent quip or sarcastic remark at hand. He’s got a little bit of a shady past, but he grows throughout the season and clearly comes to care more about his dad and the others in his life. I love especially how he is always watching out for Olivia (and I hope this will turn into something more later in the show), who probably doesn’t think she needs the help; but no matter how strong a person is, they cannot stand on their own. In a way, I think Peter and Olivia need other (at least platonically) because they both have been so independent. Walter grows leaps and bounds in the first season. He goes from being in a mental institution, to learning how to cope with the real world, to growing more happy, but at the end of the season he comes to grips with what he did in the past and how it is affecting what is happening now, and trying to cope with that. He too cares about Olivia, and of course for Peter, even if Peter doesn’t feel that way from Walter’s long absence in his life. He’s also hilarious and is always craving some food he hasn’t had in 17+ years. Olivia is extremely serious about her job and works very hard at it, not leaving room for much else in her life. Once she did open up her heart, and it ends up burning her, and it affects her throughout the season. Yet she does seem to trust Peter and Walter, as well as fellow FBI agent Charlie. We also get to see some interaction between Olivia and her sister and niece, which shows a more familial side of her. She is exactly the kind of female character I enjoy. All the minor characters are complex and interesting too, with the exception of one who is just so annoying it’s not even funny, but let’s just say they take care of it on the show. Several of the major and minor characters seem to operating in various shades of gray, and it will take time to see their true colors. One character that I really like but feels a little flatter than some of the others is Astrid, a junior FBI agent who’s always in the lab with Walter. Thankfully, her character is on the show for all five seasons, so I imagine she will continue to grow. I don’t want to say too much more about the overall story line, because it’s so much more fun to discover it on your own. Let’s just say that just when you think the show is getting a little formulaic (still very interesting, but formulaic nonetheless), they throw you some curve balls and plot twists, and they really shake things up at the end (though sadly I kind of knew some of it was coming, partly due to listening to speculations from a podcast called The Fringe Podcast and partly due to the show being out long enough and having apparently picked up on at least a couple of spoilers accidentally). Season One is clearly just the beginning of a story that continues for four more seasons. I do have one really big beef with season one in how one particular story arc and character arc was “resolved” and handled. I don’t want to get specific, but it starts in the pilot episode and the “resolve” happens about halfway through the first season, and it feels extremely inconsistent. I am hoping it’s not the actual end and that it will come up again, because it really did not feel right at all. With this in mind, as well as with the hope that the subsequent seasons will just get better and better, I am going to rate season one of Fringe four out of five stars. This is an extremely strong first season for a show, and I would highly recommend it. I will warn it can be a little gory sometimes, but just look away for a little while and you’ll be fine. It’s worth it to watch this show play out. It’s intelligent, funny, and dramatic all at once. I started watching Fringe when the pilot first aired, and I’m delighted to see that it’s still attracting fans. It’s also great that you so thoroughly enjoyed the first season, as that wasn’t a very popular view during its run. 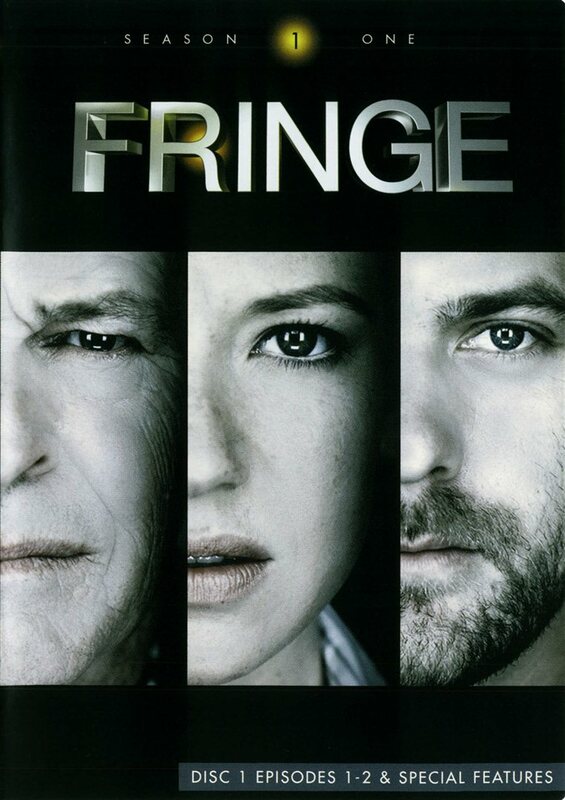 But Fringe just gets better and better; the twists are mind-bending, and it never loses that balance of suspense, drama, and those lighthearted comedic moments. Olivia, Peter, and Walter are some of my favorite television characters of the last few years. I hope you enjoy the rest of the seasons, especially my personal favorite, Season 3. It’s interesting because I’ve been listening to a podcast while going through the show, and they were watching it while it was airing, and sometimes they would be like, “This episode was good, but I don’t know, compared to Lost…” And I’m thinking I haven’t seen Lost, but a “bad” first season episode of Fringe is better than most TV shows out there in my opinion. And of course Fringe was clearly not as developed as Lost at the time they were running concurrently. Anyhow, I’m excited about it getting better and better, because I definitely see the potential! I really like the way the second season starts so that gives me a lot of hope for the rest. And now I’ll be looking forward to season three especially! I probably consider Lost my favorite TV show, but the way people compared it to Fringe in the early years, as you’ve seen, often made Fringe come out looking the lesser of the two, ignoring that Fringe is actually a much more focused show than Lost. I think that people just had too high of expectations for Fringe, which it thankfully met in the subsequent seasons. Anyway, enjoy the rest of the ride through the show and listening to the podcast. I didn’t listen to a Fringe podcast every week, but when I did, it added so much more to my viewing experience; they come up with the most interesting ideas sometimes. I do enjoy listening to the podcast because of the theories they come up with! I’ll continue to review the seasons as I go so stay tuned! Sounds a little bit like the X-Files, which I used to watch religiously when I was a kid. Thanks for the review! I’ve never seen the X-Files, but I have heard some comparisons to it, so I imagined that if you liked it, you would probably like Fringe too! I’m about halfway through season one of Fringe and it’s taking me a while. (I guess I just don’t have a lot of time for TV watching?) I do find it interesting and quirky, but for some reason I’m just not getting hooked. I think part of it might just be a reluctance on my part to get into another TV show created by JJ Abrams after the disappointing denouements (or lack thereof) on Lost. I do find it amusing that both shows have the same guy doing the music. It’s sooo obvious and it makes me snicker every time I hear those screeching, chaotic violins. I’ve never seen Lost, and my co-worker and another friend have assured me that the overall story is worth it, so I’m hoping I agree! I find the story interesting but I think what keeps me coming back is my love for the three main characters. You’ve never seen X-Files or Lost?!? I’m kinda shocked about that. Anyway, nice review. I was always on and off with Fringe while it was on the air. I’ve only seen a few episodes. I liked what I saw. I got Netflix, so that may be the next show I’ll look at after I’m done with “Angel”. Garrett and I aren’t actually really big on TV shows… or maybe I should say we’re pretty picky about what we choose, especially when it comes to what is currently on TV versus what’s on DVD. We only watch one or maybe two shows at time while it’s live, and any other TV we watch is on DVD. For a while we talked about watching Lost with Graham but that never happened. So we’ll see… we might get around to it one day. Fringe is really great when you watch it in order, especially for the episodes that focus more on the over-arching story than a self-contained story. I was thinking about our lack of LOSTing the other day. Hmm …. Maybe one day… We’re really enjoying season two of Fringe right now! And I listen to a podcast after each episode, which only adds to the experience and to my conspiracies. I watched the first few episodes a few years ago, and then I just stopped. I’m not really sure why…. You should! I enjoyed the first season but I’m enjoying the second season even more! It’s always interesting and always keeps me guessing! Well, I’ve gotten through the first season on Netflix. I’m really enjoying it. It’s cool to finally see the season without getting interrupted. You’re right about the big twists that come and go. Here’s hoping season 2 is better. Season two is even better! I just posted a review of it and it’s spoiler free (which means it doesn’t really say a whole lot, since it’s hard to talk about the season and not talk about spoilers!). Glad you’re enjoying it!